(CV-15: dp. 36,380; 1 888'0"; b. 93'0"; e w. 147'6"- dr.28'7" s. 32 k.; cpl. 3,448; a. ae. 80-100, 12 5", 68 40mm., 5920mm. ; cl. Essex) The second Randolph (CV-15) was laid down 10 May 1943 by Newport News Shipbuilding & Dry Dock Co., Newport News, Va.; launched 28 June 1944;sponsored by Mrs. Guy M. Gillette; and commissioned 9 October 1944, Capt.Felix Baker in command. Following shakedown off Trinidad, Randolph got underway for the PanamaCanal and the Pacific. On 31 December she reached San Francisco where AirGroup 87 was detached and Air Group 12 reported on board for 4 months duty. On 20 January Randolph departed San Francisco, for Ulithi whence shesortied, 10 February, with TF 58. She launched attacks 16 and 17 Februaryagainst Tokyo airfields and the Taehikawa engine plant. The following dayshe made a strike on the island of Chichi Jima. On 20 February, she launchedthree aerial sweeps in support of ground forces invading Iwo Jima and twoagainst Haha Jima. During the next 4 days further strikes hit Iwo Jima andcombat air patrols were flown almost continuously. Three sweeps againstairfields in the Tokyo area and one against Hachijo Jima followed on 25February before the carrier returned to Ulithi. Riding at anchor at Ulithi 11 March, a kamikaze "Frances,"a twin-engine bomber, hit Randolph on the starboard side aft just belowthe flight deck, killing 25 men and wounding 106. Repaired at Ulithi, Randolphjoined the Okinawa Task Force7 April. Combat air patrols were flown dailyuntil 14 April when strikes were sent against Okinawa, Ie Shima, and KakeromaIsland. The following day, an air support mission of fighters, bombers,and torpedo planes hit Okinawa and a fighter sweep struck an airfield insouthern Kyushu. Under daily air attack from 17 April on, Randolph continuedto send her aircraft on CAP and support missions throughout the month. During May planes from the carriers hit the Ryukvus and .southern Japan,Kikai-Amami Island naval base and air fields and Kyushu airfields. Becomingflagship TF 58 on 15 May Randolph continued her support of the occupationof Okinawa Shima until 29 May, when she retired via Guam to the Philippines. On her next war cruise, as a part of Admiral Halsey's famed 3d Fleet,Randolph made a series of strikes up and down the Japanese home islands.With Air Group 16, replacing Air Group 12, the ship launched eight raidson 10 July against airfields in the Tokyo area, principally those on thepeninsula east of Tokyo Bay. On the 14th, her planes struck the airfieldsand shipping in and near Tsugaru Strait. In this attack two of the importantHonshu-Hokkaido train ferries were sunk and three were damaged. Attackson the Japanese home islands continued for the next few days, and, on 18July, Nagato lying camouflaged alongside a pier at the Yokosuka Naomi Base,was bombed. Moving southwest, Randolph and other carriers were off the east of Shikoku,24 .July, for an antishipping sweep of the Inland Sea, during which thecarrier battleship Hyuga was heavily damaged and airfields and industrialinstallations on Kyushu, Honshu, and Shikoku were hit hard. Randolph's pilotsestimated that, from 10 to 25 July they had destroyed 25 to 30 ships, rangingin size from small luggers to a 6,000ton freighter, and had damaged 35 to40 others. Randolph's strikes continued right up to the morning of the 15August surrender, when her planes hit Kisarazu Airfield and surroundinginstallations. Following the end of the war, Randolph headed home. Transiting the PanamaCanal in late September, she arrived at Norfolk, 15 October, where she wasrigged for the "Magic Carpet" service. Before the end of the year,she completed two trips to the Mediterranean area to return American servicemen.Then, in 1946, she became a training ship for reservists and midshipmen,and made a Mediterranean cruise in the latter half of the year. After another voyage to the Caribbean, she embarked midshipmen in the early summer of1947 for a cruise to northern European waters. Randolph was placed out ofcommission, in reserve, 25 February 1948 and berthed at Philadelphia. Reclassified CVA-15 on 1 October 1952, Randolph recommissioned 1 July1953. After shakedown off Guantanamo Bay with Carrier Air Group 10, shetook on Carrier Air Group 14, departed Norfolk for the Mediterranean, andjoined the 6th Fleet on 3 February 1954. Deployed to the Mediterranean for6 months of Fleet and NATO exercises during 1954 and 1955, Randolph enteredthe Norfolk Navy Yard 18 June 1955 for installation of an angled deck andother modernization. 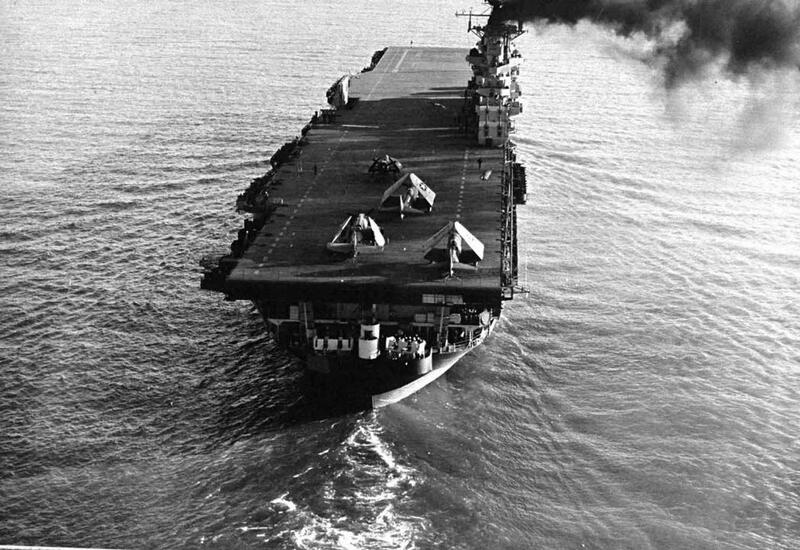 Leaving the yard in January 1956, Randolph conducted air operations offthe east coast for the next 6 months, and was the first Atlantic-Fleet carrier to launch a Regulus guided missile from her flight deck. On 14 July 1956, Randolph again steamed east for a 7-month tour of duty with the 6th Fleet in the Mediterranean. When Israel, Britain, and France invaded the United Arab Republic in October of that year, Randolph stoodready. Operating near the Suez Canal, her aircraft provided air cover andsurface and air reconnaissance for the evacuation of U.S. nationals fromAlexandria. She returned to the United States 19 February 1957. After a few months operating off the east coast, Randolph deployed tothe Mediterranean again 1 July 1057. Between August and December, as politicalturmoil in Syria threatened to further disturb the already turbulent Mideast,she patrolled the eastern Mediterranean. Back in the United States on 24 February 1958, the flattop made her 5th Mediterranean deployment 2 September 1958 to 12 March 1959. Randolph was reclassified CVS-15 on 31 March 1959, and conducted ASW operations off the east coast throughout that year and the next, receivingher fourth Battle Effieciency "E" in a row in September 1960.After overhaul at Norfolk, Randolph sailed for operations in the Caribbean and served as the recovery ship for Astronaut Virgil Grissom on America'ssecond manned space flight, a suborbital shot. In February 1962, Randolphwas the primary recovery ship for Astronaut John Glenn on his flight, thefirst American orbital voyage in space. After his historic three-orbit flight,he landed safely near destroyer Noa from which he was transferred, by helicopter,to Randolph. In the summer of 1962, Randolph again steamed to the Mediterranean. Returningto the western Atlantic as the Cuban missile crisis broke, she operatedin the Caribbean from the end of October through November. After a Norfolk overhaul, Randolph resumed her station in the Atlantic. During the next 5 years she made two Mediterranean cruises and a northern European cruise,while spending most of her time off the east coast and in the Caribbean. Randolph earned three battle stars for World War II service.